If you want to be authentic in selecting your Victorian decorating colors, you'll need to explore the historical Victorian palette of colors. Many of the present day Victorian homes offer a brighter and wider selection of colors. The Victorian era is generally marked by Queen Victoria's reign (1837-1901). The thirty years following the United States' Civil War was one of great growth and change which marked the Industrial Revolution. The architectural styles became known as Victorian. Authentic, original Victorian colors were a rather muted palette with many varied hues of ochre, russet, beige, taupe, brown, and ecru. Victorians believed in dramatic contrasts. These color choices were made by trendsetter and Victorian landscape designer, Andrew Jackson Downing, who believed a house should blend in with its natural surroundings. He accomplished this by selecting colors found in nature. It's also important to note that bright pigmentation was more expensive to produce than those paints created by grinding up plant life, tree bark and rocks. The natural tints didn't fade like the bright colors which made them better economic choices. 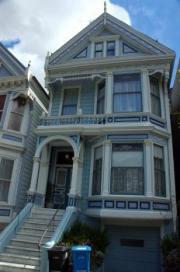 Some Victorian homes, however were not painted in these muted colors but in very bright and vibrant colors. As early as 1885, a newspaper account described the homes along Nob Hill in San Francisco as being painted in very 'loud' colors. 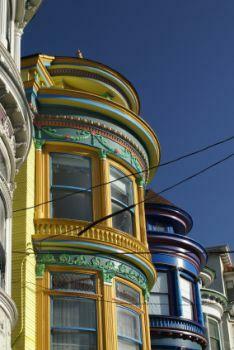 These homes were from both the Victorian and Edwardian era and were later dubbed the 'Painted Ladies'. The colors used to paint these mansions were bright yellow, orange, chocolate, blue, and red. Interior colors were typically the traditional earth tones often in deeper hues of red, amber, emerald, and dark brown. Drama was part of the effect by using different rich deep colors so each room felt important. Victorians loved expressing the financial growth afforded by the Industrial Revolution and reflected their good fortune in home decorating. Hallways were painted in neutral shades of gray and tans as were entrances. These colors were enhanced by using various faux painting techniques that imitated authentic design elements at a fraction of the cost such as marbling, stenciling and wood-graining. Victorians implemented the use of complementary colors (opposite colors on the color wheel) to further enhance the dramatic interiors. Wallpapers - Often vibrant floral and paisley patterns were used. Upholstery and draperies - These velvet, silk, damask, and tapestry fabrics came in rich and deep reds, greens and browns, blues, mauves, and purples. 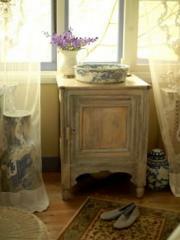 Rugs - Often large floral patterns in oversized styles gracing hardwood floors. Tassels - Found as fringe and swags on draperies, tablecloths, and chairs. These always complemented or matched the fabric. It was common to find two or three colors in a tassel. Lace - White was the most popular choice for tablecloths, although many other choices were used. The layering effect of lace and other fabrics was also used. Lace curtain were used in the Spring and Summer but replaced by heavy draperies, often made from velvet for the colder seasons. Stained Glass - An architectural element introduced into the homes, stained glass featured brilliant colors in art nouveau or better known as Art Deco style. Found as panels in doors, beside doors, over staircases, and many other rooms in the home. A house painted in authentic Victorian colors appears drab and dark in comparison to a modern Victorian home that will often use more than the traditional three colors. Modern Victorian homes will use as many as five to seven colors to highlight the various gingerbread trim and architectural features. Victorians loved paying attention to detail. The gingerbread trim and layering of lace and fabrics were some of the expressions of the unleashed creativity that reigned during this period style. You can add your own interpretation of Victorian decoration colors in your home. Typically Victorians used three colors on the exterior of their home by using trim colors to contrast and accent the main house color. The use of three colors created a dramatic result. During the post Great Depression (1929) whitewashed homes became popular due to the economic considerations. Paint stores usually have a Victorian palette for you to use in your color selections. You can decide on the individual palette and go modern Victorian or strict authentic Victorian. The choice is up to you and your individual preference and taste. Deciding on the perfect Victorian decorating colors for the interior and exterior of your home can be a fun process as long as you remember it's your home and you have the freedom to decorate it however you want.